HITEC is the premiere event of its kind, with over six thousand attendees from the hospitality field from CEO’s to CIO’s to industry professionals in finance and technology – all converging to see the latest in innovation – as technology changes the way hotels, resorts and clubs serve their guests and members. 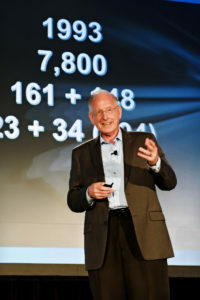 This is the second time Berkus has keynoted an HFTP conference – the first in 2008. Dave Berkus speaks and the hospitality industry listens. One of the most popular keynote addresses ever. Your talk was the most thought-provoking, entertaining one I have heard in years. I am moving ‘machine learning’ to the top of my development list as a result. Great, important keynote! Yours was the best keynote I have seen in many years! Everyone was talking about it long after. A hit! The most important, and the most urgent message presented at HITEC this year. The ~55 year cycle is again upon us. There is both opportunity and risk. Change with the current or be toast. Set your compass by the direction Dave has described, or be lost at sea. There are many strong financial reasons the changes Dave describes will occur. The pace accelerates. Thank you, Dave for these words to the wise!